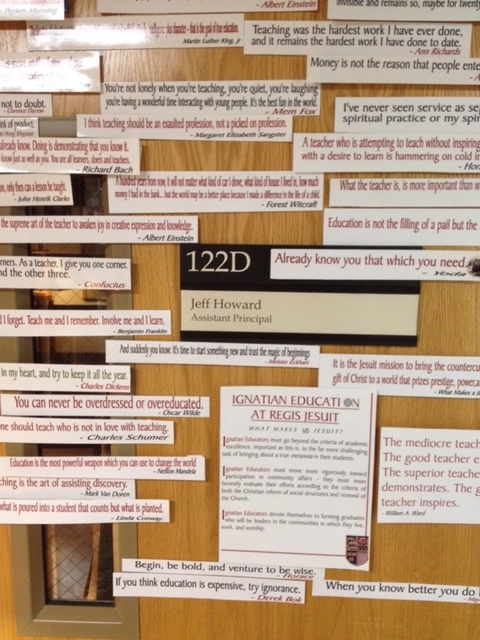 Author andtherecameadayPosted on February 10, 2016 Categories Education, Education Blog, Ignatian Education, Jesuit Education, Teach & Serve, Teacher, Teacher, Teacher Blog, Teaching, Teaching BlogTags Catholic Education, Education, Education Blog, Ignatian Education, Ignatian Educator, Jesuit Education, teacher, Teacher Blog, Teachers, teaching, Teaching Blog, Teaching Techniques, Teaching Tip, Teaching Topic7,263 Comments on Teach & Serve No. 26 – Is It Getting Hot in Here? Decisions and the processes we go through to make them define who we are as teachers and administrators. Wait, let me state that another way: educational professionals are often called upon to make decisions. Important ones. No, that’s too strong. One more try here: educational professionals can be called into many situations and scenarios in which decisions must be made. Not quite right. One more attempt: educational professionals are frequently faced with having to make decisions. Terrible… it seems hard (at least for the purposes of trying to illustrate my point in this post day) to simply and clearly state that teachers and administrators make decisions. I think there are many reasons why this is true, but let’s clear one thing up for purposes of this discussion. Making decisions is different than making choices. Teachers and administrators are asked to make choices constantly. Which book will we read? What unit comes first? Which teacher will have what “other duty as assigned”? And so on and so on. These are choices, not decisions. Choices are important, no question about that, and choices fill our days as teachers and administrators. But decisions are bigger deals. Decisions and the processes we go through to make them define who we are as teachers and administrators. The longer one spends in education, the more time an individual puts into the job, the more likely she or he is to be asked to make decisions or to take part in some decision making process that will be important to the school. As opposed to choices, the types of decisions to which I am referring here have high stakes, impact and gravitas. These decisions affect our future as educators and the future of our schools. Decisions are about who we are and what we want to be. Decisions can change the course of our professional lives and alter the direction of our institutions. So, how to we arrive at them? What process do we employ? What do we do – as individuals and as schools – to make decisions? My fear is that, often, we don’t. We don’t actually make decisions. Sure, we embark on a process. We have conversations. We weigh the pros and cons. We engage. We talk. Through this, clarity about the direction we might want to go sometimes emerges. Sometimes it does not. The trouble with decisions is that they are, in fact, big deals and they do, in fact, have a lot at stake in their making. As such, they can cause tension and disagreement. They can foster unrest. They can make us uncomfortable because they are not choices, they are decisions and the ones we make – and how we make them – says something about who we are and charts the course of where we are going. As administrators and teachers, we are well served to have practiced our decision making process before we actually have to make any decisions. We better know how we make decisions and the manner in which we do so prior to actually making some. At the end of the day, our decisions are just things. They are results. Decisions are made and we and our colleagues agree with them, disagree with them, celebrate them, revile them. Decisions are things. And, frankly, they are less important, sometimes, than the process with how we made them. As we engage in making decisions, it can be easier to settle. It can be less challenging to ourselves and our communities to ease into decisions, to slide into them. When we know we’re staking a claim for our future, it’s natural to approach with trepidation and caution. With second guessing. Without confidence. It’s easy to slide into new positions. It’s harder to reach out and take them. Let us be confident in how we do so, confident in the process we employ and confident in our decisions. Let us practice and make perfect. We will be stronger teachers and administrators when we develop facility making decisions. We will be stronger leaders when we stop sliding into our positions and start deciding them. Our students and our staffs should know us as decision makers. If nothing else in life, I want to be true to the things I believe in and, quite simply, to what I am about. I now I’d better because it seems, whenever I take a false step or two, I feel the consequences.